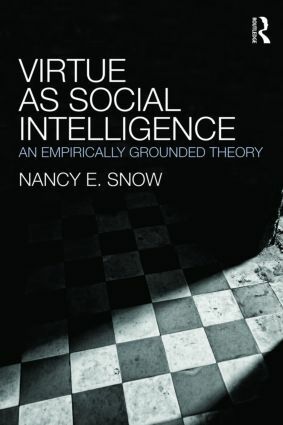 Virtue as Social Intelligence: An Empirically Grounded Theory takes on the claims of philosophical situationism, the ethical theory that is skeptical about the possibility of human virtue. Influenced by social psychological studies, philosophical situationists argue that human personality is too fluid and fragmented to support a stable set of virtues. They claim that virtue cannot be grounded in empirical psychology. This book argues otherwise. Drawing on the work of psychologists Walter Mischel and Yuichi Shoda, Nancy E. Snow argues that the social psychological experiments that philosophical situationists rely on look at the wrong kinds of situations to test for behavioral consistency. Rather than looking at situations that are objectively similar, researchers need to compare situations that have similar meanings for the subject. When this is done, subjects exhibit behavioral consistencies that warrant the attribution of enduring traits, and virtues are a subset of these traits. Virtue can therefore be empirically grounded and virtue ethics has nothing to fear from philosophical situationism.